For the price of a single-ride MetroCard, you can see an array of artwork in any of the new Second Avenue Subway stations. There’s a new contemporary art museum in town. The admission price? $2.75. The place? The Second Avenue Subway’s newest stops at 63rd, 72nd, 86th, and 96th Streets. 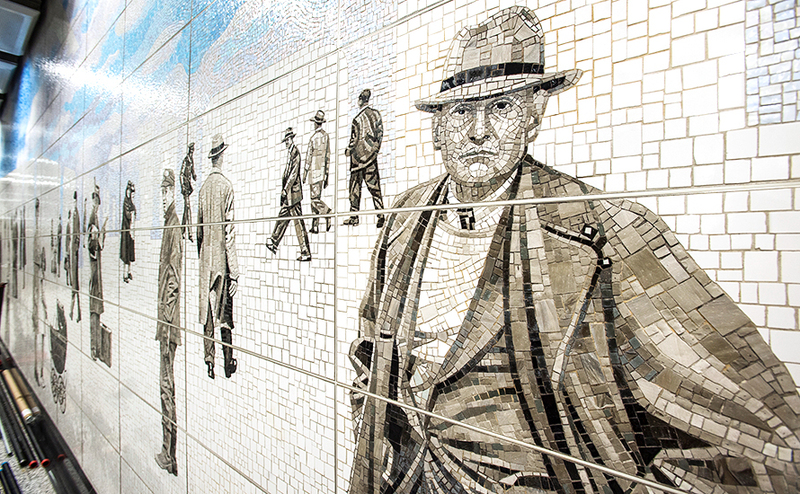 The tiles that line the stations’ walls now incorporate installations of permanent, large-scale contemporary mosaics—unlike anything New Yorkers or tourists have seen at any MTA subway station. 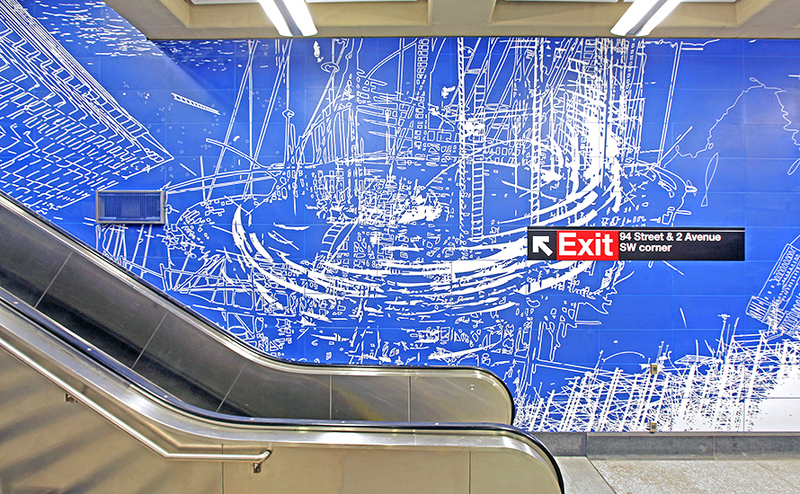 The MTA Arts and Design department, which has been making subway stations more aesthetically pleasing since 1985, commissioned works by such artists as Sarah Sze, Chuck Close, Vik Muniz, and Jean Shin. Each has a station dedicated entirely to his or her work. So if you don’t usually find yourself taking the Q (the line that now runs along Second Avenue), go hop from station to station and browse this new subterranean museum as you travel through New York. The Brazilian artist’s work focuses on liminality and shows the in-between moments of New Yorkers’ underground commutes. Muniz showcases imagery of strangers in everyday scenarios—from a police officer eating a Popsicle to a boy holding seven pizza boxes to an off-duty mascot in a tiger costume—standing next to one another waiting on a subway platform. The work, which spans the 72nd Street station, features more than 36 diverse New Yorkers, including Muniz himself, captured spilling papers from his briefcase. 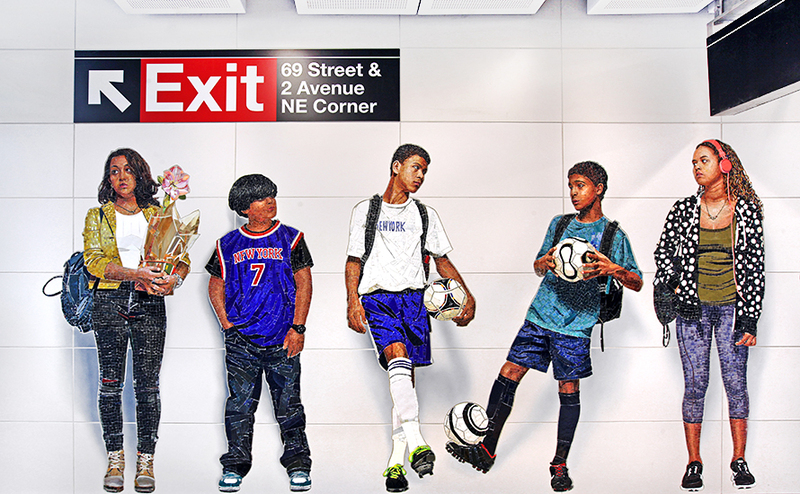 New York is known for being a diverse metropolis, so Close’s installation at the 86th Street station depicts a vibrant mix of New Yorkers. 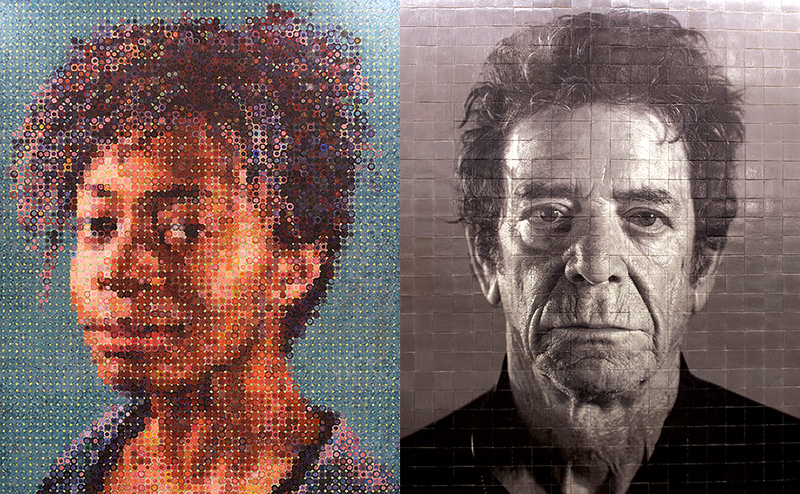 For this display, his photo-based portrait paintings were transformed into images made from mosaic and ceramic tiles. His permanent exhibit features 12 nine-foot-tall portraits of cultural legends and artists like Lou Reed, Philip Glass, Kara Walker, Zhang Huan, and Cecily Brown, as well as self-portraits of the artist himself. loose-leaf paper caught up in gusts of wind.